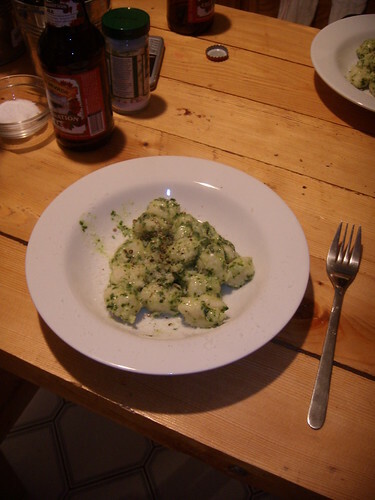 gnocchi with fresh lemon pesto, originally uploaded by aarn! +7th April, 2008+. thanks to phil for the recipe for this way back in the day. I made a fresh potato gnocchi and served it with a pesto that i whipped up real quick, i made the pesto a little light on the garlic and added some lemon zest, thought that it would make the meal seem a little less heavy. served this with a old school ceasar salad dressing that i made with anchovies from london (purchased at harrod's), and also some nice home made croutons that i made from a dense block of foccacia.